Similarly Quakers have a tradition of testimonies, statements about issues that Friends have found vital for our faith and practice. In August I will have the honor to attend and participate in the annual gathering of Baltimore Yearly Meeting to be held in the North West corner of Maryland at Frostburg State University. In filling out my registration form, I scanned the workshop offerings. The following workshop arrested me. Bottled Water and the Quaker Testimonies: Can They be Compatible? Americans spend $15,000,000,000 a year on bottled water. The world spends $15,000,000,000 a year to develop and to provide potable water to the developing world. The petroleum used to make the plastic bottles would fuel 100,000 US cars for a year and 80% of those bottles go to land fills. 3,000 children die each day from polluted water. We will use the Testimonies to examine our role and to set a new direction. Leader: Byron Sandford is Executive Director of William Penn House, a Texan with roots in the Chihuahuan Desert of West Texas and southern New Mexico. I have written before about bottled water and the trouble I have with it. (I don’t even think about all the plastic bottles we use for soda and other fizzy drinks since I think they are stupid products that my dad used to remove barnacles from his boat and forget people drink then. But hey, drink the carbonated stuff if you like it). I understand that we can be in situations where we have little choice but to buy and use bottled water unless of course we cannot afford to do so. Recently Auntie Doris got her very own SIGG water bottle (she actually nicked her mom’s which sat in a cupboard in Gurensey). Why not use our own water bottles that we fill ourselves? In the US, the water industry goes unregulated. The water we buy in bottles comes untested by the government and often is no better than filtered tap water (which we already pay for through taxes and our water bill). Sometimes it is much worse. 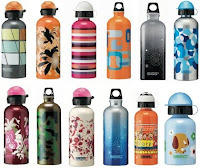 One of the biggest issues around bottled water that has weighed on me recently is about plastic products. Plastic: What a wonderful and awful product! So versatile, and it’s in EVERYTHING (probably even Cool Whip!). And it is not going away for a very very long time. Like pretty much never. Can I live without plastic? To which I have had to answer a resounding NO, at least not with my current lifestyle (no I do not refer to the gay lifestyle, whatever that may be, but to the American lifestyle of one who you will find constantly on-line, on the phone, or on a plane). Can I live one day without plastic? Sure on the island of Iona on a retreat, but consider all the plastic required to get me there and and hold all my stuff. Can I live one hour without plastic? I will continue to hold this query up in my mind. As a Christian, I feel I need to be a good steward of the Earth’s limited resources. As a Christian living in the US, I feel that any effort I can do, I need to do since my country is one of the largest contributors of waste and the use of petroleum-based products in the world. 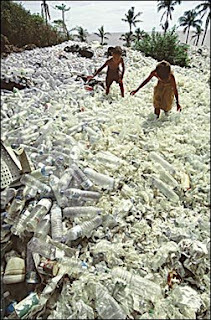 Now if you do use plastic bottles, try to recycle, although I don’t see recycling as a real solution. It requires energy to transport these bottles and more energy and waste to “recycle” them. Most of these bottles do NOT get recycled anyway as creatively illustrated in the following video. Good questions, now I’ll be asking those questions of myself. I love my beautiful bottle, although it is already badly dented. I don’t think I have bought any drinks in plastic bottles since I got it and my colleagues at work take the piss out of me for carrying it around with me. Not that I am bothered about what they think though!! Good questions to pose though. I would love to live without using anything plastic, unfortunately it is something that will be almost impossible to do. I am almost as passionate about carrier bags. I refuse to use them and have a rather fetching selection of cloth bags. My home island of Guernsey is pushing to become carrier-bag-free. Totally. I really hope they achieve it as it would be amazing. The biggest problems they are having though as with major corporate retailers who have issues with getting rid of their free bags. Keep talking about this…it never ceases to amaze me watching people who otherwise try to be halfway decent stewards of the environment, who still buy bottled water by the case. It’s just…ew. Especially if you live in a city with a decent water supply, as I do. Every time I drop something out of my fridge, which is often because it is rather poorly designed, I am very thankful that the bottle, tub, whatever, is made of plastic and did not shatter on my kitchen floor and bare feet. So yes, I need plastic. But I also always recycle said bottles, tubs, whatevers, and don’t buy cases of bottled water, either. on June 29, 2008 at 10:42 pm | Reply Joe G.
I don’t know if any of us want to totally live without plastic. I’m serious. There are actual medical and practical uses for it. And for some people (Marvin) 90% of their wardrobe depends upon it. I completely share your sentiments about bottled water and have been avoiding it as much as possible in the last few years, for other reasons in addition to the ones you mentioned. I work in a profession where I test people’s water frequently… it was a very sobering experience one day to test the generic Walmart-branded water which is sold to thousands of people daily… only to discover that this particular bottle had more nitrates in it than your average hot dog! For the uninitiated, excess nitrates can severely harm the nervous system and cause cancer!! !